It is believed, hat applesauce cake appeared in the USA during World War I and the Depression. As far as people couldn't afford eggs, butter and sugar, they found a substitution to them and used apples turned into sauce as an ingredient that gave sweetness and moisture to cakes. Even today applesauce cake is not forgotten and can be used by vegetarians, who want to cook cakes without eggs and butter. 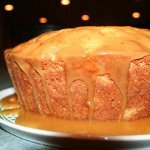 If you want to make the best applesauce for your cake, then take apples like Granny Smith, Golden Delicious or any other variety, that is good for cooking. Peel apples, add some spices, lemon juice, lemon rind and sugar. Simmer them until apples are soft. Discard the aromatics and mash apples. Use applesauce to make the batter and bake the cake. If you want to enrich the taste of applesauce cake, then you can add nuts, like pecan, walnuts or almond, pineapple or cherry preserves.